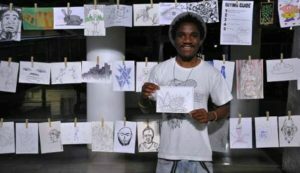 The most long-standing supporter of innovative art-for-charity event, 1000 Drawings Jozi, is undoubtedly Clem Phiri. He’s prone to hiding his light under a bushel, but we tracked him down for this interview. The first thing he said was, “Don’t forget to mention 1000 Drawings founders Felix and David!” Don’t worry Clem, we won’t. Many thanks to Clem for sharing his 1000 Drawings journey with us. If you’d love to give a doodle and make a difference, here are guidelines, or send us an email at info@1000drawings.co.za.